Our Alaska Avalanche Store currently includes our own avalanche fieldbooks. Our shop is small, so all orders receive personal attention. To order, just give us a call or drop us an e-mail and let us know what you want. We accept payment by credit card, and can usually get books to destinations in the US within a few days to a week. Sorry, we have only 7 fieldbooks left as of late November, 2015, and they will be out of print until we have the $4,000 from other projects that the next print run will cost us. The remaining books are reserved for students in the UAS Level 1 course; contact us by e-mail for orders and pickup. We hope to do a new printing in February 2016. First test edition of The Alaska Avalanche Fieldbook, Valdez, Alaska, 2003. Photo © Kent Scheler. None of the fieldbooks out there quite met our standards, so we had our own books printed up by Rite in the Rain® for our fieldwork and courses. 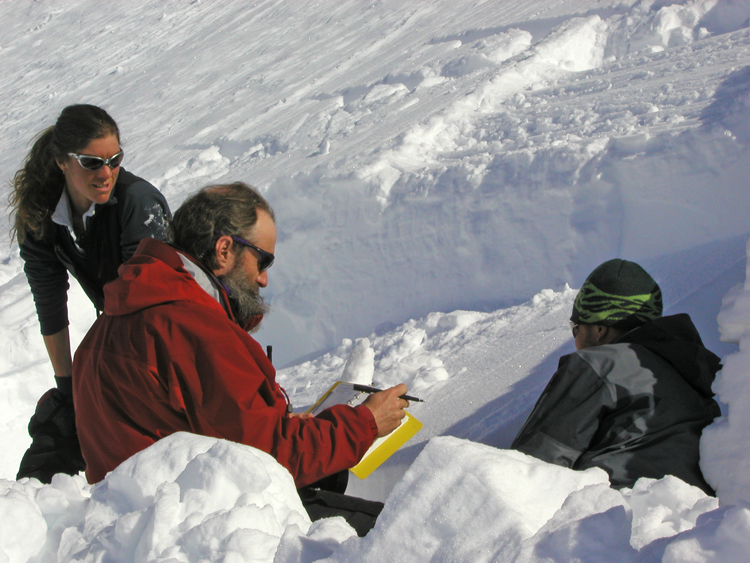 They are fully compliant with the American Avalanche Association's SWAG observations guidelines, and contain key pages that are essentially cheat sheets for taking notes, evaluating snow, decision-making, terrain analysis, and emergency medicine. We have put enough time into refining these books over years of use and revision that they get their own page with full details. Closeout Deals on G3 Skins! Alpinist Skins, 130mm width, XL length for 189-199 cm skis; 1 pair left; sale at $99.00.